School and Unit Planning | Ooh! Guess What! – The current math curriculum has been around since long before the computer, and the nature of mathematics in society has changed to become more computer-based. – In our school district, in a tech hub of northern Colorado, a child can actually choose, in the year 2013, to never take a programming course beyond their sixth-grade tech class. Ever. They can actually opt out of learning to program. – Yet students cannot opt out of learning to solve systems of inequalities with a pencil. This seems backwards to me. – My own understanding of mathematics deepened when I learned to program computers. I made a promise to myself to incorporate programming into my common-core-based seventh-grade math class this year. This is a heavy promise. I am not teaching programming as an end in itself (even though I believe that is worthwhile). I need to integrate the common core standards and teach programming with a purpose. It is not easy. Yet I was really proud of the first unit we did and the first unit project my students pulled off. Our first unit was on congruence transformations. I gave students the task of creating a computer program that created a design with symmetry. It had to include two transformations, and they could choose from translations, rotations, and reflections. They had to describe their transformations in a write-up and explain how they created them. 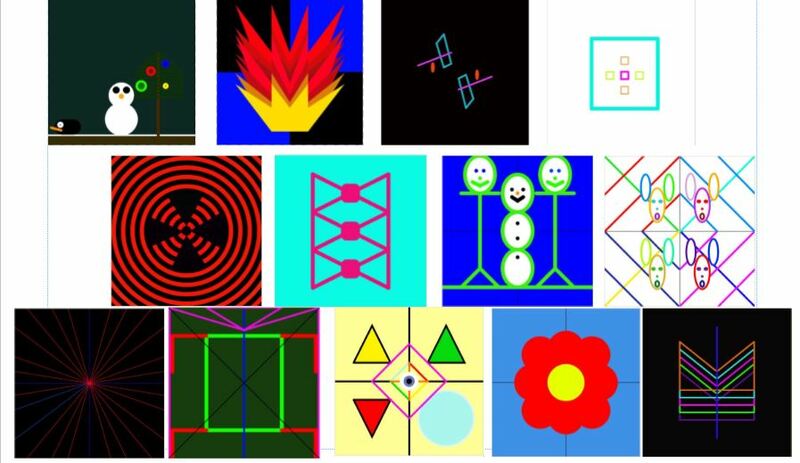 Here are a few examples of the incredible artwork my students produced with computer programs. It took several days but was WELL WORTH IT. I was so impressed with the quality of their writing and their ease with using the difficult math vocabulary. They really had to think hard about transformations to make their projects work, and the results were nothing short of amazing. Student work from our programming project on congruence transformations! I didn’t expect the results to be as good as they were, frankly, but it turned out to be a great project not just as a way of introducing programming, but also to really understand congruence transformations deeply. Here is the rubric I used for the project. I would really encourage you to try it. I’ve been emboldened to do more with computer science in math – the key being to hold on to the mathematical purpose behind it. I am immersing myself a bit more into the blogosphere this year. Last year I noticed some middle school math teachers on twitter would post a #MsSunFun blog post each Sunday on a middle-school appropriate topic. I love the idea and would like to join in! Here’s a grand tour of Ms. DuPriest’s math classroom! I had to do a lot of cleaning and purging to get it so nice for the year and I’m pretty excited for how it turned out. My kids eventually figure out that organization isn’t my strong point, and they never see it looking so tidy ever again once the school year gets going. Here is the view from the back of my classroom, looking toward the front. I try to be mindful of this when seating kids in the back of the room. The classroom is longer than it is wide, so there’s a lot of space and kids between the back and the front of the room. You really have to try hard to pay attention from back there. I have a mix of desks and tables, so I set it up in clusters. I am a big believer in cooperative learning. This is my classroom technology and treeware! Thanks to some generous grants and very supportive taxpayers, we have access to some great classroom technology. We actually have 1400 computers for a school of 1050 kids! Wow! I have a class set of Dell Netbooks and a class set of clickers (I love these for formative assessments and immediate feedback for the students). Technology has fundamentally changed how we use math in society, and I like to plug kids into this reality. We use the netbooks for flipped teaching (watching video lessons), exercises on Khan Academy, creating spreadsheets, collaborating on Google Docs, writing computer programs, and making presentations. My colorful crates have Math’s Mates worksheets in them. These are old-fashioned treeware but they’re a key differentiation tool. My classroom has seventh-graders and a handful of sixth-graders and eighth-graders who are learning the seventh-grade math curriculum. To support their different levels of math readiness, I let them choose (with some guidance) which weekly Math’s Mate they want to do. Most of the time, they pick a Math’s Mate that is a good level of challenge. The most common complaint is, “Ms. DuPriest, this Math’s Mate is too easy. Can I go up a level?” Kids like a developmentally appropriate challenge. This year, I will have students working on Red, Blue, Green, Mauve, and White Math’s Mates all in the same classroom. We split into groups for discussion, work, help, and making corrections. Here’s where I put the Plan of the Day and such. “YSBAT”, written on the bottom of the board, is “You Should Be Able To”. Our daily objective(s). One schoolwide improvement initiative is to work on literacy strategies and metacognition, so I also put up there the thinking strategies of the day and the Standards of Mathematical Practice. We were working on fraction word problems to start off, so I encouraged the kids to use various models for the fraction word problems and thought these strategies were worth talking about. I also hide random math problems around the room that the students can solve for fun and sticker awards, so you can see random problem #1 up there. I just noticed in the past that if you post interesting problems on posters, kids like to come up to you and say “I think I solved it!” So I vowed to always have something for their brains to work on when they are idle. I’ll change up the problems every couple of weeks or so. This is a flexible learning area that has doors that open to the neighboring classrooms, but the widest part opens up into mine. I love this room because it’s great for small-group lessons, but also because it’s both reward AND consequence. I can say “Your group is doing a great job with such a rich discussion. Would you like to finish it up in the sun room?” or “Young lady, I cannot teach with this constant distraction. Please go sit quietly in the sun room and work until I have a chance to process this with you.” Love my sun room. I swear, I had the desk completely clean on the first day and look, after four days of students it’s already covered with junk. I either need to sharpen my organizational skills or my sense of humor just to deal with myself. Probably both. Toward the end of last year, a teacher told me that he and his students were talking about the current events issue of having teachers carry guns. A student raised his hand and said “I don’t think it’s a good idea. Look at Ms. DuPriest. She can’t even find her keys.” This is the reputation I have! I am excited about the start we’ve had, and I have an awesome group of kids this year. Very polite and eager to learn. We’re going to do some great math. The room is set up and the students are set to arrive! I’m going to lay out my goals for the 2013 – 2014 school year. 1) Renew my commitment to reducing paper use. At our first staff development day, we learned we have 1400 computers for a school with 1050 students – we are now MORE than a 1:1 technology school. As such, I’m feeling guilty just thinking about making a lot of copies. We have lots of electronic options, I have a cart of netbooks in my classroom, and all students have a Google Docs account. I will manage electronic portfolios and make use of the one notebook that students come in with. 2) Make it a priority to create a culture of high expectations and trust. The students need to know that when they have a job to do, everyone will pitch in and do their share of the heavy thinking. I will start with this expectation and have the students set goals and evaluate their progress on it. 3) Weave technology in thoughtfully. 21st century math skills are computer-heavy and we’ll emphasize the use of programming, spreadsheets, and apps not just for the sake of using technology, but for building conceptual understanding! My ultimate goal with this is to have an integrated pre-algebra / programming class that really mainstreams computer science. I really can visualize this in the not-too-distant future. 4) Honor my students’ differences. I’ve got wildly diverse classes this year, and they all deserve access to higher math – I will use all the differentiation strategies I know to help them grow. 5) Let it go at home. I need to acknowledge with the busy schedule I have taxiing two young kids (and myself) around, very little is going to get done for school in the evenings. I’m breaking my own rule by blogging while my girls watch tv 🙂 but I do need to free up my mind at home and really be present in my family’s life when I’m here. So with that, I’m signing off. It’s that time of year again! 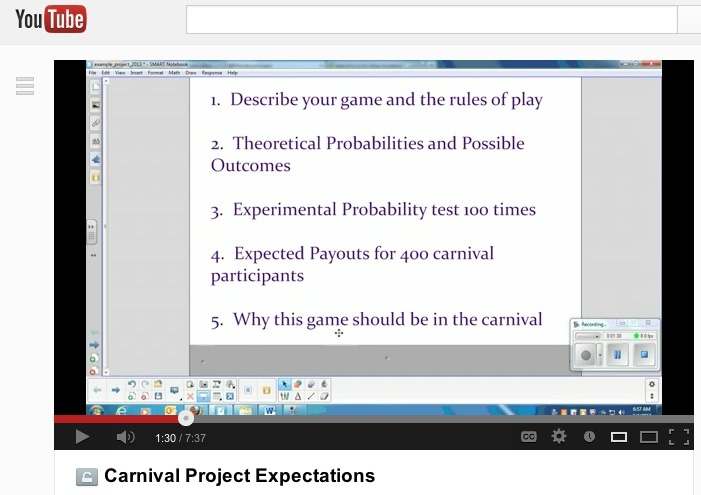 A few years ago, one of my colleagues finished a probability unit by having a mini-carnival with student-created games. The next year, the entire seventh-grade team took part, and now, the mini-carnival has turned into the capstone math event of the year – the Probability Pi Day Carnival. Hundreds of students attend, and it is a terrific celebration of learning and math. Students create their own carnival game, calculate the probability of winning, do an experiment, make some predictions, and pitch their game to the carnival committee. I described the project to students by creating a video describing the requirements and going over an exemplar. The kids came up with some clever and creative games! They’re currently working hard on calculating the probability of winning, both theoretically and experimentally. Then they will need to predict how many prizes they need to give out, so the carnival committee knows what supplies are needed. I’ll post more about the games they’re creating tomorrow. Their final project will be a model of their game, and a media presentation describing their game and the math behind it. It can be a document, presentation, video, or anything they wish. The best part is the school carnival, which is on Pi Day. It’s awesome to see hundreds of kids in the building, celebrating their learning in math. Kids talk about their projects for years to come. The community supports us by donating prizes to give away, and we sell circular treats such as pizza, fruit, and cookies. I will update more as we get closer! I attended some personal financial literacy training last weekend, presented by the Colorado Council for Economic Education. In Colorado, we’ve adopted the Common Core State Standards (CCSS) mostly, but with added standards for Personal Financial Literacy… which show up in our standards tagged with (PFL). A couple of co-workers and I thought the training would be a good introduction to what we need to teach in the new standards, and we weren’t disappointed! If there’s one enduring understanding I could take away from personal financial literacy, it’s that “every choice has a cost”. The ability to analyze and make informed judgments on the costs of your choices could make a big impact on your future success. In sixth grade, the standards include saving for goals, using percents to solve saving and investing problems, and explaining the difference between saving and investing. In seventh grade, we move on to understanding taxes – computing taxes, describing the role of taxes in society, and demonstrating the impact of taxes on your income and spending. In addition, students should be able to compute interest and use unit rates to make purchasing decisions. In eighth grade, students should understand how credit and debt impact their life goals, and describe the components of credit history. There is a lot there, and we don’t tend to cover financial literacy well now. However, it helped me to think of the big understanding, that the thread woven through many units of study must be helping students to analyze the cost of choices and make good judgments based on that analysis. I want to put in a plug for the Council for Economic Education and the Financial Fitness for Life books. The books have kid-friendly resources that cover finance problems, and put them in context of analyzing choices. You can view some activities on the companion web site for the middle school books – click on a lesson and get to some information about the lesson and web resources. I’m working on adding this analysis to the conversation as we work on our units on percents, probability, and linear algebra. We are working in a unit on rates and ratios, and I wanted students to be able to understand different applications of rates, such as area. In one workshop, I introduced some warmup questions and then a mini-lesson on unit rates, followed by some work time on some more complicated area questions. These are just old CSAP/TCAP released items, but they’re great problems that can be solved a number of different ways. The kids worked hard and came up with some clever solutions. Some pitfalls came up – some obvious, others not so. I’ll put a link to the whole activity below. It was exported from the SMART board software. Moving right into calculating the time to plow the field, without calculating the “square feet per minute” rate first. Calculating “feet per minute”, or the length of the field that can be plowed in one minute, instead of area. Dropping zeroes when multiplying, making the field an order of magnitude smaller. I really encouraged students to think about the reasonableness of their answers, knowing any of the above mistakes would give them answers that should raise flags. All in all, it was a good activity and I was pleased with how well the students worked together and struggled with the problems. Some groups moved on to the food court problem, but many groups did not get there yet, and we haven’t summarized that part. We have 3 teachers on the seventh-grade team at our school, so we often have flexible grouping days. We use these days to split the kids into “support”, “target”, and “enrichment” groups. We work with the kids on remediation of some concepts they are not secure with, or extension and depth if they’re ready. Since the topic of study this week was unit rates, we gave the kids a pre-assessment and then grouped them into three groups. My team felt this was a pretty successful day of flexible grouping, where all groups of kids made some growth toward their targets. Another big success was that we went paperless! With class sets of netbooks in every classroom, we posted our activities on our websites and had students access them online, edit, save, and submit. We hope to do this more and more! Our school has a 40-minute intervention/enrichment period at the end of every day, and students can take a different class each quarter. This quarter, we made a decision for me to teach a computer science enrichment. We invited students to join it, with the intent of targeting certain needs. We wanted to target students who had potential to grow in math if they learned it in a little different way. The invitation list consisted of some partially-proficient math students who might make a big leap if they learned math in a non-traditional class, and some gifted students who might enjoy an extension to what they knew. We created the class to be balanced between girls and boys. I’m enjoying writing a curriculum that gives kids an intro to programming but also weaves in math topics. I am making things up a little as I go, based on what kids want to learn next. Here is what we have done so far, and I’ll include the links to the demo programs I made. 1) Introduction to drawing. Students learned to create shapes on the screen, and how to plot objects, thinking of the screen as a coordinate plane. We also explored RGB color – how colors on a screen are a combination of Red, Green, and Blue lights, and by turning on the lights in different proportions, you can make any color of the rainbow. 2) Variables and Expressions. Students learned how to “anchor” a small drawing at certain x,y coordinates, and how to create the rest of the shape around those anchor points using variables. We discussed the relationship between these expressions and algebra expressions, and how the computer uses substitution to replace a variable with a value. 3) Binary Numbers. I really appreciated place value when I learned and understood the world of binary, so we spent a day and a half working on building that understanding. I mainly used worksheets from Computer Science Unplugged. The worksheet on this webpage is great and very kid-friendly. 4) Functions. In elementary school, students get used to a representation of a function as an “in/out” machine. In middle school, we extend that to equations that include variables, and they are related to these old “in/out” rules of the past. In computer science, a function is also an in/out machine. It takes parameters as inputs, does something to them, and outputs something new. I showed the students how they could make their little character from Lesson 2 appear on the screen multiple times by wrapping it in a function. The computer again uses substitution to use the input parameters. For advanced students, they learned how to make their drawing appear randomly by substituting a random number instead of a fixed one. Next, we will work on creating algebra expressions with our variables to make our drawings animate. We’ll also learn about “if” statements and how they can be used to make decisions. Loads of fun! I’m loving it.